What do you believe makes a person look approachable and friendly? Many people would answer, “A smile!” If you are less than thrilled with the condition of your own smile – but aren’t ready to consider drastic cosmetic procedures – you may be interested in dental bonding! Dr. Co will use a composite resin that matches the color of your teeth. 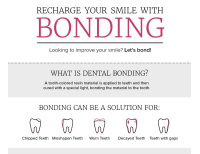 For this reason, you may choose to have your smile whitened prior to completing your bonding treatment. Whitening and bonding are two inexpensive, quick, and easy treatments that can go hand-in-hand to dramatically improve the appearance of your smile! Bonding is a great option for Shoreline dental patients who are considering cosmetic smile improvements but aren’t quite ready to commit to the tooth preparation or cost involved with porcelain veneers. Dr. Co will complete a thorough consultation with you to discuss the advantages, disadvantages, and costs involved. While bonded teeth do not require specific care, it is vital that you maintain optimal oral health with consistent brushing, daily flossing, and regular hygiene visits here at Shoreline Dental. Additionally, it’s best to avoid biting fingernails, chewing on ice, or using your teeth to open or tear items. Interested in learning more about how you can conveniently improve your smile? Call us today at 206.440.0065 to schedule a free consultation!